In 2018 the Warmth for Warriors organization is once again collecting handmade Christmas stockings to send to our troops.They collect the stockings and fill them with little items such as soaps, candy, toiletries and other small goodies. 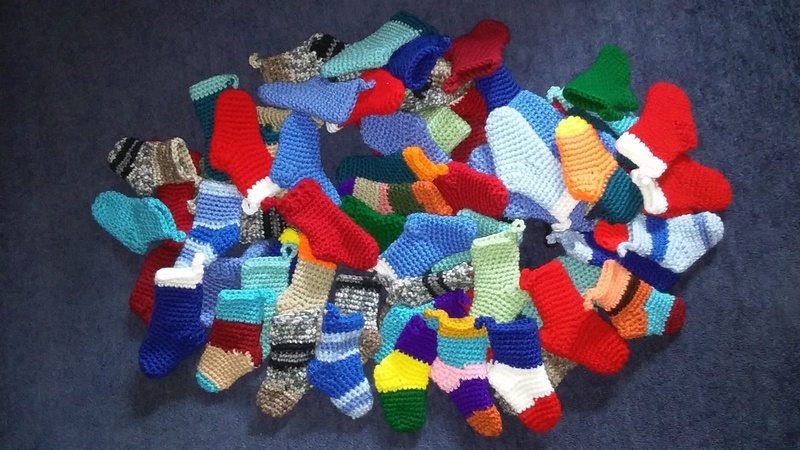 The stockings can be crocheted, knitted, sewn or woven. Stockings should be around 6 inches long and any pattern style or color is accepted. Stockings that are a little smaller or larger are okay too. We had a wonderful year in 2017 with 2,819 stockings received for the Warmth for Warriors. Let's have another banner year for our troops and give them a little extra Christmas cheer during the holidays. Thank you to everyone that has helped in the past and those stepping up again this year. Deadline for shipping stockings to Warmth for Warriors and delivery to them is November 1, 2018. Well I waited til Feb to get started on turning my little scrap balls into stockings. Then I got out the red green and white and before I knew it this is what happened. WOW what a fantastic way to kick off the 2018 stocking drive!! Thank you so much Brenda for all the lovely stockings you have been making. Here are my first two mini Christmas stockings for this year's drive. The stocking on the left is my top-down crocheted Christmas stocking using the folded-over cuff option. The other one is my version of Sucrette's mini crocheted stocking pattern worked in the round without joining to 6" long. 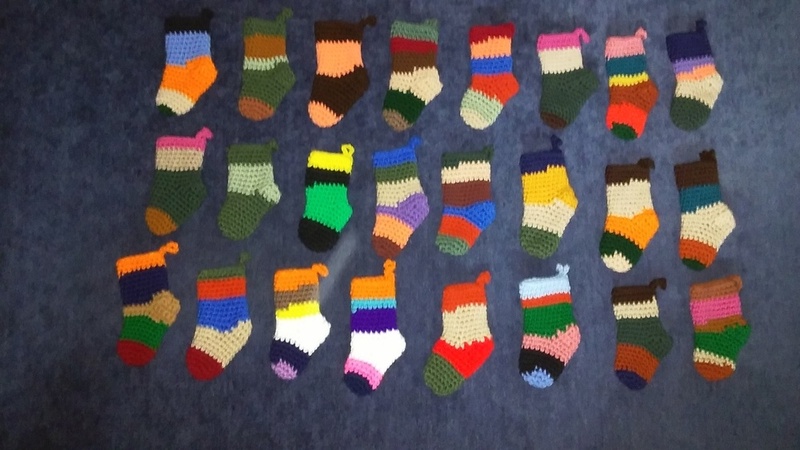 Here are a few more stockings that I have crocheted for this year's stocking drive. You can find the different crochet patterns at this link that I used. I have been working on a few more crocheted mini Christmas stockings over the weekend while I watched the NCAA basketball tournament. Here are some top-down stockings using this free pattern link. Then here are some cuffed stockings that I crocheted using this pattern. Yay Cindy more stockings. I have some more done just havent taken photos to post. Meanwhile I have been working on a lapghan to send too. Thank you for the links. Thanks Brenda. I've been on a roll with these stockings and do plan to get a few more done before mailing off the box. The box is stuffed full but I think I can squeeze in a few more little socks. 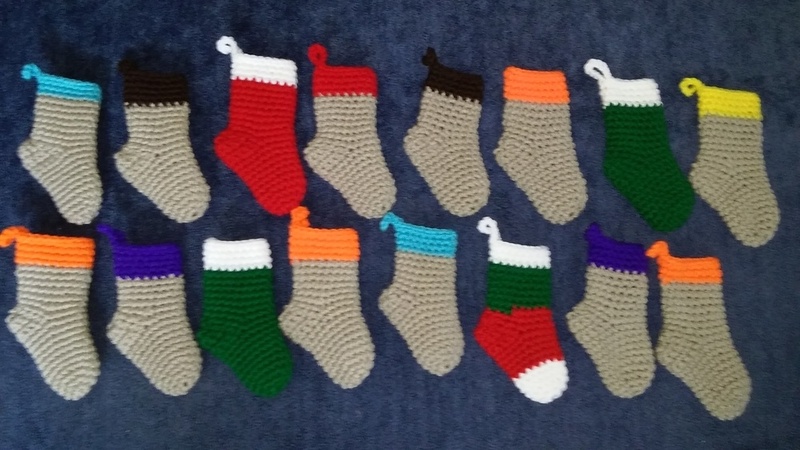 Here are a few more mini Christmas stockings I crocheted. The snowflake ones use my waistcoat crochet pattern but I only work the waistcoat stitch on the front in the chart area. for more stockings. Cindy I love the ones with the snowflakes. Great idea to do just that section in waistcoat. I think I started a whole stocking in waistcoat and it just seemed too bulky for such a small stocking. Thanks! I love the look of crocheting in the waistcoat stitch but it is really hard on my hands and fingers. I found just doing it in the chart area works out so much better for me. I have found several small charts to work on the mini stockings which have worked out for me to add to the stockings. Look for charts only about 10 rows tall. 70 stockings in the mail this morning. I have another pile of stockings started along with a lapghan to package for another time. Thank you Brenda for your wonderful contribution to this year's drive. 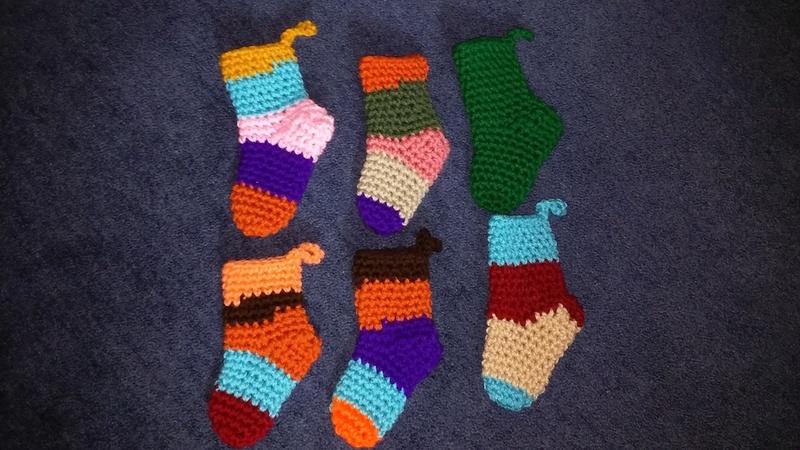 Here are a few more stockings that I have crocheted recently. Some team colors and I also played around and tried my hand with some patriotic colors. Here are two more mini Christmas stockings I crocheted this weekend. Hope everyone is having a wonderful weekend. We recently held a Warrior Wednesday charity blitz in support of the troops on another site. Here are the 3 mini stockings I crocheted during the blitz. I just want to thank everyone for their support for this mini Christmas stocking along for our troops and the Warmth for Warriors. Happy Memorial Day too. I got these done on WW. 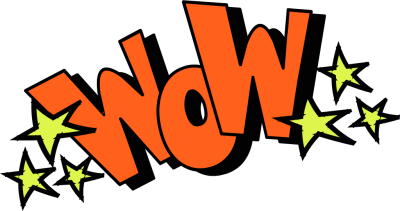 Nice job and thank you so much for joining us for Warrior Wednesday! 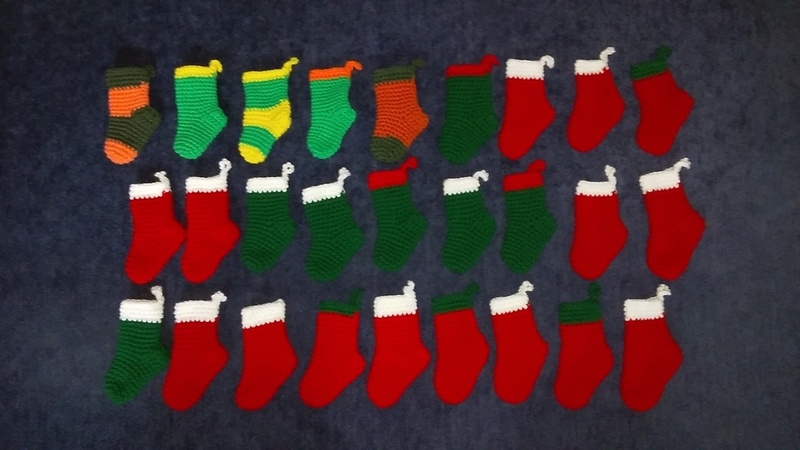 Here are a few more stockings I crocheted during the last Warrior Wednesday crafting blitz for the Warmth for Warriors. I used this cuffed mini stocking pattern in Red Heart Gleam yarn in canyon color. Thanks to Warrior Wed I now have enough ministockings (72) to mail. What a wonderful group of mini stockings. Thank you so very much! And thanks to Warrior Wednesdays I finally got another lapghan done to mail with the one that had been sitting here for the last few months.